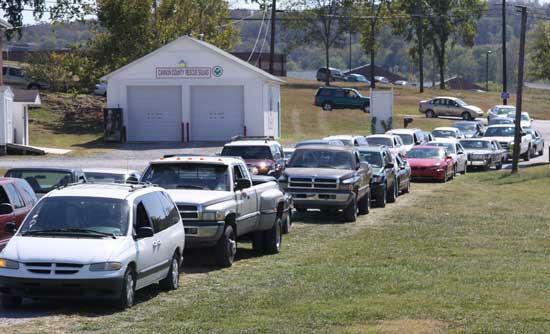 Residents lined up for free food Wednesday at the entrance to the Cannon County Fairgrounds. In what perhaps is a sign of continuing tough economic times, Cannon County residents turned out in droves Wednesday for a free food giveaway. The two-hour event, held at the Justin Pemberton Memorial Arena, was sponsored by the Cannon County REACH Afterschool Programs and Second Harvest Food Bank. Inmates from the Cannon County Jail, working under the supervision of Sheriff Darrell Young and Jail Administrator Jim Brown, loaded the food into cars as recipients drove through the arena. I recall the feeling of shame we went through and how we had to swallow our pride when we lined up in the 1930s for farm surplus food. About the only cars/trucks there were those driven by government officials. We town people walked, carrying our food in flour sacks or burlap sacks. Lots of wagons from outlying areas, no fancy buggies, but riding horses and even some mules were plentiful. The need to feed hungry children drove many to overcome their prejudices and swallow the tears that came with being on welfare--getting a free handouts and no opportunity to work out that debt. Good job by the Couier to post that picture. The working folks need to know what is going on while they are at work. California gives their welfare recipents a debit card which contains their benifits. 69 million of the dollars from those cards were spent in Vegas, cruise ships, and high end shops. There are still some who would feel shame to be take handouts. They are the folks who pay for all this. Wish I'd had a ride there. We really could have used it. Glad so many were helped though. I drive a vehicle that has 250,00 miles on it and is 17 years old and im told it has too much value to get food stamps yet i see alot of nice vehicles in this picture lined up to get free food....and i wonder why i was turned down to get help.....amazing. I struggle to support a family of 3 and drive 40 miles one way to work and can't get any help. Love the vehicles in the picture....that says it all. One in six Tennesseans on Food Stamps and roughly the same percent on Medicaid. Cannon County number probably higher than that--percent of children going thru school getting assistance on meal costs probably more than fifty percent---long line of trucks and cars just a sign of the times--if things change in DC the percents may change with more people needing assistance but fewer receiving that assistance from the government. Food Stamps, medical assistance and other programs to help the needy will be affected--including Medicare and the healthcare act. But you will not see a cutback in Defense spending where we need to take a machette. The answer may very well be in programs like the above--funded not so much by the government but by people who will donate of there own free will to assist those in need. I will say this--if those folks received handouts while chatting on their cell phone or munched on that food at home in front of a TV with a dish attached or cable attached, they cannot be shamed no matter what line they are in, even if they are picking up the food in a limo, Caddy, Lexus, BMW or Benz. tngram and scooby, I bet if you contact Reach, Food bank or even sheriffs office they may be able to make arrangements to help you. Or call justin, daily or moose and see who shows up. Reach is funded by your tax dollars and I believe the food bank operates solely on donations and volunteers. Justin your point was well taken and if you do seek further education, dont call moose. Thank you Rachel. I had to ask for help awhile back. It was so hard for me to do. However, I needed to feed my family. I was told I could get a box of food from the local church. Then they turned around and said "Sorry..we gave it to someone else." I was handed a flyer for Angel Food ministries to buy some food. If I'd had the money I would not have asked in the first place. It was very humiliating. I will just make do. I think annonomoose has said it all. tngran there are several local groups who take donated food and dispense to who ever ask. One is in Liberty (I believe Bobby Parker of Gassaway helps) and I believe they are there on weekends. Also there is one in Auburntown which Tom Ganoe is a part of. Daily, I think you're being a wee bit too optimistic by saying "IF things change in DC"
Much as I'd like to see the number of US aircraft carrier task force groups cut back by about 50%, that would put at least 30,000 servicemen out of work and the Defense budget does get spent in America for the most part. Granted a lot of that stuff ends up exploding in the Middle East right now. One last question, how is the healthcare act going to help the needy? The insurance companies are CUTTING available types of policies already and the act is only now starting to be applied. The Soetero Depression is going to make the Carter Malaise look like happy times. wichita--correct, far too optomistic--I should have said "when things change" --How many of the O'Donnells, Angles, Pauls, and those of Miller's ilk will be elected, isn't known but there will enough of a shift to bring the government to a screeching halt (even more than what we have seen recently) with a veto awaiting any legislation coming to the president that veers to the right. Two years of stalemate with more and more people being driven into poverty. Quasi-organizations like the above will be tasked to the limit. Come 2012 if the trend continues and majorities are there in the House, Senate along with a like minded president, all welfare programs will be under the knive along with Education, Social Security and Medicare--but the dollars for bullets will roll merrily down the road with perhaps even some "nation building" in Iran. Just one comment on healthcare--after cancer surgery some years back while having a company covered Medicare supplement (cancelled after surgery), no insurance company would issue me a Medicare supplement policy--one had a five year look back--providing healthcare for those with pre-existing conidtions sounds like a worthy effort for Americans. Reader, I understand better now. My wife and I are both diabetics (type2) and her osteoarthritis in her knees and spine keep her in bed anywhere from 20 to 23 hours a day. On average she's able to visit the kitchen maybe once a month. Once my COBRA coverage ends September of next year we'll either be on Tenncare or just S.O.L. The premiums I'm paying right now use up a third of my unemployment check and prescription co-pays take another third. I agree about the governmental lockup coming up. I imagine there'll be a Supreme Court case limiting the scope of Presidential executive orders before the screaming is over. I have to wonder if Soetero will break Ford's record of vetoes and when Biden will have another stroke, not that anyone will notice any difference. Someone asked me why I didn't support the OsamaBinBiden ticket and I pointed out that ANYONE who would let that braindamaged liberal blabbermouthed moron get THAT close to becoming president couldn't possibly have this nation's best intrest at heart. She, a lifelong Democrat, thought about it and reluctantly agreed. Short-sighted yellow dogs with their gold plated blinders, righteous with no comprise, will hurt this country and set us back further than we are now. Form your soapbox you add to the pile.